In the early months of 1917 German U-Boats were sinking Allied merchant ships at a much faster rate than they could be replaced and Britain faced a real danger of being starved into surrender. One of the Government’s responses to this crisis was to boost shipbuilding capacity by building three new national shipyards on the banks of the Severn Estuary, the largest of which was to be located on the rural Beachley Peninsula in Gloucestershire. On 3rd September 1917 the inhabitants of this quiet country parish were given ten days’ notice to vacate their homes in order to allow thousands of Royal Engineers and German Prisoners of War to begin construction. 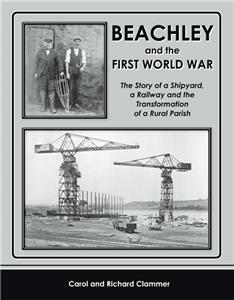 The authors have painted a vivid picture of local life before the war, the impact of the evacuation on the community and the construction of the huge shipyard together with its associated housing schemes, army and POW camps. They also record, for the very first time, the history of the railway branch line and the numerous railway locomotives which served the shipyard. At the end of the war the yard was still unfinished and accusations regarding its cost and alleged mismanagement grew into a national scandal which provided a rich vein of humour for satirical writers of the time. The scheme was eventually abandoned and the site converted into an Army Technical School while local people continued their long struggle to reclaim their homes and obtain fair compensation. This absorbing book draws on a wide range of contemporary sources and is illustrated by a superb selection of photographs and documents, very few of which have been published before. It will delight railway, industrial, military and social historians, and appeal to anyone with an interest in the local area.